Prepare to be awestruck as soon as you catch a glimpse of Villa Amarelo’s stunning, modern architecture, interspersing indoor living with the outdoors. 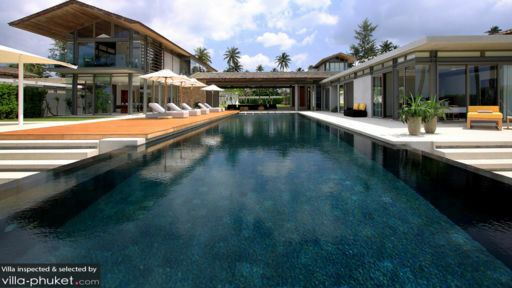 Located on Phuket’s Natai beach, with six bedrooms, sprawling lawns, an infinity pool and a gorgeous view of the ocean out front, the villa is well-suited for large gatherings, even those travelling for a private event like a birthday or a wedding! This is where all your tropical dreams will come true as you have floor-to-ceiling glass walls that always keep you in touch with the verdure of the tropical vegetation. Villa Amarelo boasts of six, air-conditioned bedrooms, of which three are located upstairs and the remaining three at pool level with direct access to the deck. The bedrooms are furnished with a mix of king-sized and single beds, to serve all sorts of requirements that you might have. The bedrooms feature glass walls are doors that ensure excellent views of the island and the beach! Elegant décor truly brings out the opulence so intrinsic to the villa’s theme and also offers an inviting ambiance. Each of these bedrooms is accompanied by an en-suite bathroom, which is super convenient and saves a bunch of time when everyone’s rushing to get ready! The bathrooms are fitted with freestanding bathtubs and/or tropical showers for the most wonderful time. 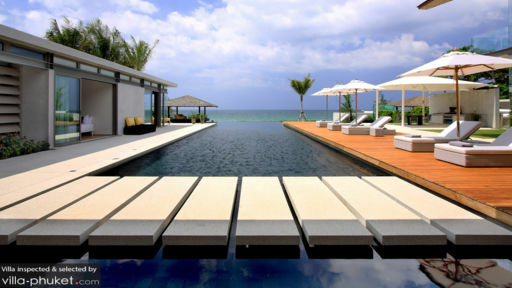 The villa is a two-storey property that features a stunning and Olympic sized, black-stone, infinity-edge swimming pool, that overlooks the splendid ocean in the distance. While the ocean dazzles and amazes in the distance, you can lounge on the sunbeds and parasols that are found on the wooden deck, to enjoy the fresh air breathing in a lungful to cleanse your body! Well-manicured garden with luscious vegetation is just a few steps down from the pool, great for yoga and meditation at any time of the day! Under a white gazebo, you will find an alfresco dining area so you can enjoy dining beside the ocean. Towards the back of the villa, there is another garden area with a pond, where kids can play around and you can even indulge in an outdoor BBQ to relish a freshly-grilled feast! An open-plan living area is located right beside the pool, where slate-grey/black couches face the glorious ocean at its doorstep! There is an otherwise all-white interior that compliments the natural greenery and blues of nature outdoors. At the back, the living room reveals the well-maintained garden and pond in order to provide a refreshing sight wherever you look. Adjacent to the living room is the grandiose media room which has been furnished with comfortable and plush couches, a flat-screen TV, and a pool table. In the far corner from the media room is the dining area and kitchen at Villa Amarelo that features a ten-to-twelve-seater dining table with black chairs situated in a glass-enclosed room to afford a breathtaking backdrop while you enjoy your food. The open-kitchen is fully-equipped with the best of amenities including a breakfast bar and bar stools. The villa prides itself in offering quality amenities and services to guests including housekeeping staff to maintain the cleanliness and maintenance standards, and there is security service to make sure you are assured of your safety. Several services are available at an additional cost including spa therapies and massages, laundry, transportation and personal chef. If you’re looking for a peaceful holiday getaway where you can have the beach all to yourself, then you’re at the right place as Natai beach is a more laid-back vibe without much footfall! You can head there directly for a fun and relaxed day on its sandy shores.